Price Range £199 - £200Price RangeSimply drag the slider bar to set your price range. Shark R&D engineers have created the Vision R series 2 helmet that offers the panoramic aperture of an open-face helmet with one of the widest veiwing angles currently available on the market, combined with the safety of the latest generation of full-face fibre shell's. The shark Vision R series 2 is lighter than the original Vision R and is fitted with an improved front ventilation system. 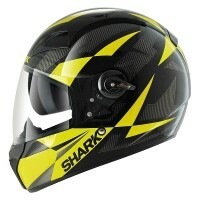 Other features on the Shark Vision R series 2 helmet include; integrated anti-scratch drop down sun visor, auto seal outer visor closing system and fully removable interiors. There is also a planned location for Shark's Sharktooth Bluetooth system.